Gavin has already discussed John Christy’s misleading graph earlier in 2016, however, since the end of 2016, there has been a surge in interest in this graph in Norway amongst people who try to diminish the role of anthropogenic global warming. I think this graph is warranted some extra comments in addition to Gavin’s points because it is flawed on more counts beyond those that he has already discussed. In fact, those using this graph to judge climate models reveal an elementary lack of understanding of climate data. Fig. 1. Example of Christy’s flawed evaluation taken from Comparing models to the satellite datasets. The upper left panel in Fig. 1 shows that Christy compared the average of 102 climate model simulations with temperature from satellite measurements (average of three different analyses) and weather balloons (average of two analyses). This is a flawed comparison because it compares a statistical parameter with a variable. A parameter, such as the mean (also referred to as the ‘average’) and the standard deviation, describe the statistical distribution of a given variable. However, such parameters are not equivalent to the variable they describe. The comparison between the average of model runs and observations is surprising, because it is clearly incorrect from elementary statistics (This is similar statistics-confusion as the flaw found in the Douglass et al. (2007)). I can illustrate this with an example: Fig. 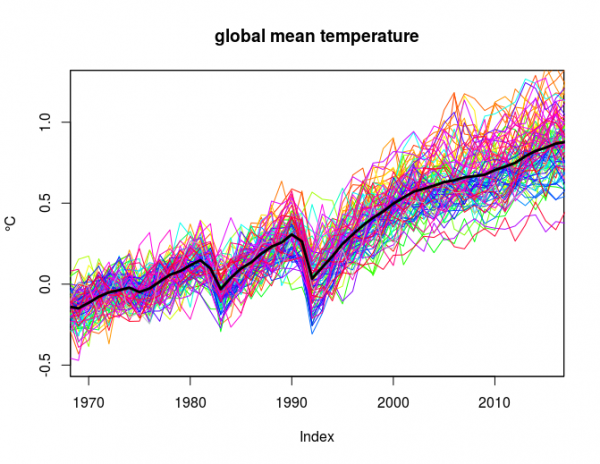 2 shows 108 different model simulations of the global mean temperature (from the CMIP5 experiment). The thick black line shows the average of all the model runs (the ‘multi-model ensemble’). None of the individual runs (coloured thin curves) match the mean (thick black curve), and if I were to use the same logic as Christy, I could incorrectly claim that the average is inconsistent with the individual runs because of their different characters. But the average is based on all these individual runs. Hence, this type of logic is obviously flawed. To be fair, the observations shown in Cristy’s graph were also based on averages, although of a small set of analyses. This does not improve the case because all the satellite data are based on the same measurements and only differ in terms of synthesis and choices made in the analyses (they are highly correlated, as we will see later on). By the way, one of the curves shown in Fig. 2 is observations. Can you see which? Eyeballing such curves, however, is not the proper way to compare different data, and there are numerous statistical tests to do so properly. A proper comparison between the satellite temperature and the model results needs to estimate a weighted average of the temperature over the troposphere and lower stratosphere with an appropriate altitude-dependent weighting. The difference between the near-surface and tropospheric temperature matters as the stratosphere has cooled in contrast to the warming surface. It is fair to compare the satellite record with model results to explore uncertainties, but the satellite data is not the ground truth and cannot be used to invalidate the models. The microwave sounding unit (MSU), the instrument used to measure the temperature, measures light in certain wavelength bands emitted by oxygen molecules. An algorithm is then used to compute the air temperature consistent with the measured irradiance. This algorithm is a model based on the same physics as the models which predict that higher concentrations of CO2 result in higher surface temperatures. I wonder if Christy sees the irony in his use of satellite temperatures to dispute the effect of CO2 on the global mean temperature. It is nevertheless reassuring to see a good match between the balloon and satellite data, which suggests that the representation of the physics in both the satellite retrieval algorithm and the climate models are more or less correct. The two graphs (courtesy of Gavin) below show comparisons between tropospheric mean temperatures (TMT) that are comparable to the satellite data and include confidence interval for the ensemble rather than just the ensemble mean. This type of comparisons is more consistent with standard statistical tests such as the students t-test. The graphs also show several satellite-based analyses: the Remote Sensing Systems (RSS; different versions), University of Alabama in Huntsville (UAH; Different versions), and NOAA (STAR). All these curves are so similar (highly correlated) that taking the average doesn’t make much difference. Fig. 3. 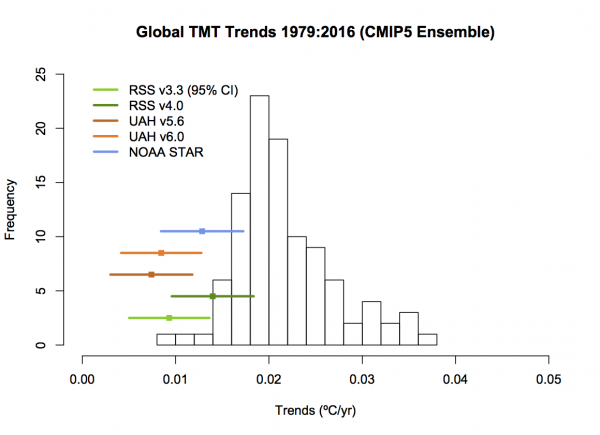 Comparison between the evolution of the global mean tropospheric temperature (TMT). From Gavin. According to Fig. 3, the tropospheric temperature simulated by the global climate models (from the CMIP5 experiment) increased slightly faster than the temperatures derived from the satellite measurements between 2000 and 2015, but they were not very different. The RSS temperatures gave the closest match with the global climate models. Fig. 4. Comparison of global mean tropospheric temperature trends where the satellite estimates are shown with confidence intervals. Trends for each model run also have similar error bars (not shown), but the trend statistics for the ensemble is presented through a histogram. From Gavin. Fig. 4 shows a trend analysis for the 1979-2016 interval where the satellite-based temperature trends are shown with appropriate error bars. The trends from the satellite analyses and the model results overlap if the confidence limits are taken into consideration. The biggest weight of the troposphere temperature trends come from the tropics because it accounts for the largest volume (half of the Earth’s surface area lies between 30°S and 30°N due to its geometric shape), and they are therefore sensitive to conditions around the equator. This is also where large-scale convection takes place that produce bands of high clouds (the Inter-Tropical Convergence Zone – ITCZ). Cloud formation through convection and condensation is associated with release of latent heat and influences the temperatures (e.g. Vecchi et al., 2006). It is part of the hydrological cycle, and a slow change in the atmospheric overturning, moisture and circulation patterns is expected to have a bearing on the global tropospheric temperature trend estimates. This means that the picture is complex when it comes to the global tropospheric temperature trends because many physical processes have an influence that take place on a wide range of spatial scales. Despite the complicated nature of tropospheric temperatures, it is an indisputable fact that Christy’s graph presents numbers with different meanings as if they were equivalent. It is really surprising to see such a basic misrepresentation in a testimony at the U.S. House Committee on Science, Space & Technology. One of the most elementary parts of science is to know what the numbers really represent and how they should be interpreted. Any chance you could plot RATPAC data as well? I’d be interested in seeing what that looks like compared to the models because, to my knowledge, RATPAC is warming faster than all satellite indices. 1. 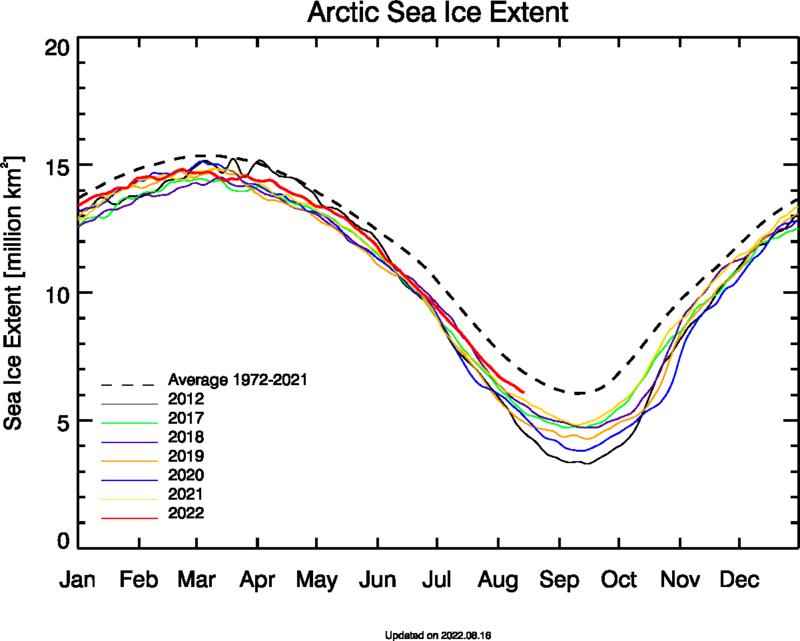 Arctic sea ice may have already reached it’s seasonal peak. 2. Christy has a history of dishonesty. Am I reading your Figure 3 correctly to say that the results from CMIP5 have a warming rate twice as high as that from observations? In what sense is that “slightly faster”? Well, yes, but the elephant in the room is that we live on the surface, and Christy never shows the good agreement there. So his entire presentation starts by cherry-picking, then proceeds. And then, on top of that, as noted here and in the May 6 2016 post by Dr. Schmidt, the models modestly overstate warming high above the surface. But not outside of the appropriately-calculated confidence interval. So it’s fine to point out the technical problems with Christy’s analysis. But if you are talking about government policy, the first thing you need to do is emphasize that Christy has directed your attention to the wrong set of numbers. From a practical perspective, no one on earth cares about what the temperature is 3 miles above the surface. I also have an odd technical comment, in that I assume that Christy’s numbers are simple volume-weighted averages of the atmosphere. Every cubic kilometer counts the same. Whereas from an energy-balance standpoint, to tell how far the models are from predicting the heat content of the atmosphere, they ought to be mass-weighted. There’s little atmospheric mass up where the model projections differ most from observations. I have to admit that I am a statistical dummy. I took the required statistics class in college…and passed it, barely. So it is not surprising (to me either) that the explanation of the statistical errors in the referenced paper are a complete mystery. I have no problem BELIEVING that mistakes were made, but have not the least UNDERSTANDING. I mention this not for reasons of masochism, but to suggest that folks in a similar condition (meaning 99.99% of the worlds population?) are unlikely to respond to the criticism of this paper with anything but continued disgust with a “scientific community” that cannot “explain” anything in a way that is understandable. I do not know if there is any way to overcome this problem (if, indeed, it is one). But I do know that the support of folks like me is necessary to the continuation of the scientific project. Without that support, science will be Trumped by populism. For comment 4 (GS), I’ll take a shot at a layman’s explanation. Look at the top pair of graphs from Christy. Note the absence of any error bars. Look at the bottom pair. Note the absence of any error bars around the observational data (the lower lines). The scientific issue isn’t whether model and observation disagree. They typically will. The question is whether or not the disagreement might occur by chance, given all of the various structural and statistical uncertainties in the estimates. Or, by contrast, whether it is so large, compared to uncertainty, that you can “reject the null hypothesis”, meaning in this case, I guess, reject those climate models predictions as being inaccurate. Christy violates the standard approach to scientific analysis by not doing that. By ignoring the error bars. I’ll go further, extending my cherry-pick comment above. It’s not as if Christy doesn’t understand how this would be done correctly. So I am forced to conclude that he a) understood that doing the analysis correctly would substantially weaken the policy point he is trying to make, and so b) chose to do it incorrectly. I think this is actually subtly different from the error in the Douglass et al. paper, but it is definitely in the same family. The only way to make your point is to ignore the uncertainty of either the model predictions, the actual observations, or both. And that’s just not good science. You are unfortunately wrong, because KMNI provides Data by different Layers, you have to scroll down and read the netcdf file. But i dont know if he does, but it i had talked with Gavin about this (E-Mail) and he told me about his graph “These are properly weighted with some stratospheric contribution. ” and thats what we see in difference, since the sat products are contaminated by stratosphere, it would offset some warming. Rep. Lamar Smith’s House committee on Science, Space and Technology held a hearing on climate change Tuesday. One can read the written testimony and watch the video at the committee web site. I didn’t watch the hearing, though I might decide to waste a few hours at a later date if our incredible early Spring weather flips back to Winter and the snow piles up outside. The sciencey stuff was presented by Patrick Michaels, a long time member of the denialist camp. 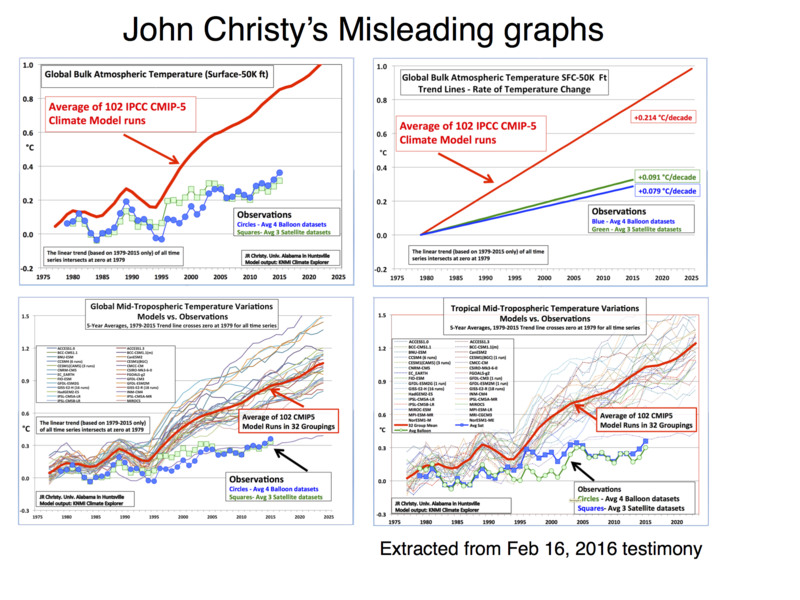 His testimony centers on a re-presentation of John Christy’s favorite graph from last year’s hearing in which model results are compared to satellite and balloon data. He also presents a new Christy graph comparing trends arranged on a vertical dimension. Funny thing, Michaels includes lots of published references, but the Christy graphs are only referenced back to the previous hearing’s graphical data, which Christy apparently has not published. Michaels does admit that Christy padded his graph by adding 3 years of data to the ends of the filtered satellite data, an obvious fiddle which I pointed to last year. Since John Christy wasn’t a witness, there was no possibility to challenge the validity of his graphs. Since the February 2016 hearing, Christy admitted applying a theoretical emissions profile to selected model results in order to calculate the simulated MSU TMT measurements from 102 model projections used in his graph. 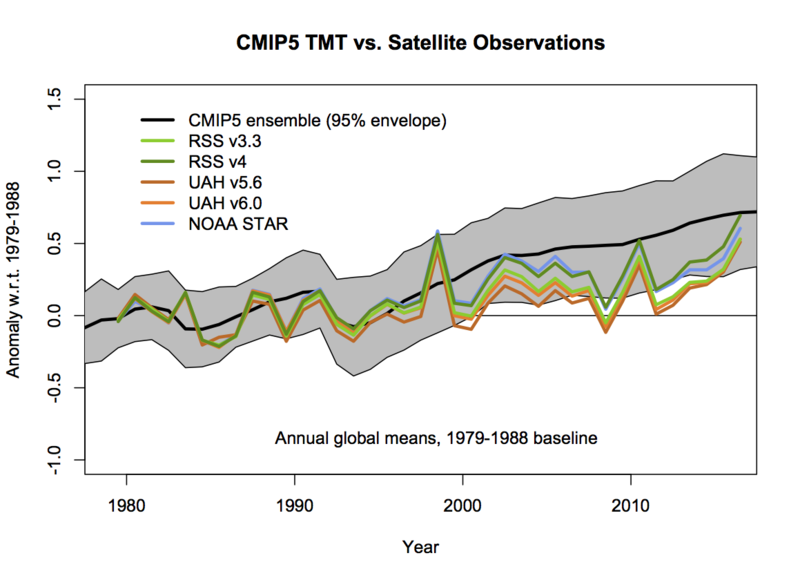 The CMIP5 model data used appears to have been taken from the KNMI Climate Explorer archive of monthly results. Christy also applied a similar set of profile weights to create simulated MSU results from the balloon data.. Presumably, he used the same approach for his new graph of trends vs. height. So, both of Christy’s comparison graphs present theoretical model results, not actual measurements, as the graphs and testimony imply. Never addressed is the question of whether it’s appropriate to apply a single TMT profile to monthly data which includes the full range of global latitudes and seasons. Also not discussed are the differences between the MSU/AMSU results from the three groups which present TMT data, which I described in a paper just published. One would think that Christy, who claims to ba a scientist, would have published his results over the past year, telling the world exactly which method(s) he employed and providing archived data sets for others to replicate and critique. But, no, this is all a political smoke screen, designed to buttress the decades long efforts of conservative Republicans who are now in control of Congress and who are hell bent on destroying any US effort to limit CO2 emissions in the name of continued growth of production and profits. The Earth’s living beings will suffer the consequences of their magical thinking. What would it be like if you did “understand”? How would you know? It really is a serious question that we deal with in education. I’ve often asked the same thing of people who argue for one technique or another saying “but they can’t un..der…staaaand Y if they don’t do X”. OK, so what’s the test that we perform? It’s different at an “advanced” level, perhaps; we get some experts and have you defend your thesis. But the 99.9%, who just passed one course (in any math/science subject, not just stats) and never had experience applying it to meaningful problems in the real world? My confident assumption is that you will not “understand” in any definable way. Now, I can tell you how to fix it, and there have been fitful efforts that you can reference by typing “math wars”. Start early, in grammar school, and keep people busy doing quantitative reasoning (not performing algorithms) until they graduate from college, whatever the major. In other words, practice. Not likely to happen, though. My apologies — I meant to refer to Fig.4 (your figure, I think, not Christy’s). Is Figure 4 comparing the appropriate CMIP5 output to the comparable satellite data? None of the individual model runs has the shape of the multi-model (“model ensemble”) mean line. That’s not a failure, because we expect the global temperature to *not* follow that multi-model mean line. That’s a stronger statement than “we don’t expect the global temperature to exactly follow the multi-model mean line.” It would be disappointing if any of the individual model runs followed that mean line, because it is quite clear that the global temperature varies a lot more than that. That’s because the global temperature in the short term is weather by definition, and only in the long term is climate. So what we expect is for global temperature to vary a lot day to day, month to month, year to year, and even decade to decade, in response to variations in internal variations such as ENSO; and to variations in forcings such as volcanoes, insolation, greenhouse gas emissions and absorptions, and reflective aerosol emissions. We do expect that the resulting wavy actual global temperature line will follow the *general*pattern* of all those model runs. That includes expecting the observed temperature line to usually stay within the range of all those model runs (the bounds of the ensemble). We expect it will not hug the ensemble mean; we expect it will swing up and down across that mean line, sometimes all the way to the edge of the range (not just to the edge of 95% of the range). The CMIP5 project had multiple models, most produced by different teams. Each model was run at least once, but some were run multiple times with different parameter values or structural differences. The set of all model *runs* is a “convenience sample” of the population of all possible model runs. Indeed, it is only a “convenience” sample of all possible *models*. “Convenience” sampling in science does not have the “casual” or “lazy” implication that the word “convenience” does in lay language. It means that the sample is not a random selection from the population, and not even a stratified random sample. In this case, it is impossible to randomly sample from those populations of all possible model runs and all possible models. Therefore the usual “confidence limits” related concepts of inferential statistics do not apply. What does this distribution of model runs represent? It is multiple researchers’ attempts to create models and model parameterizations that span the ranges of those researchers’ best estimates of a whole bunch of things. So it does represent “confidence” and “uncertainty,” but in more of a subjective judgement way than the usual “statistical confidence interval” that most people have experience with. The climate model runs’ lines’ shapes do a good job of reproducing the sizes and durations of those large swings above and below the model ensemble mean. What the models do poorly is project the timings of those short term changes–for example, internal variability’s oscillations due to ENSO. The sizes and durations of temperature oscillations due to ENSO are projected well, but the phase alignments of those oscillations with the calendar are poorly projected. “It is fair to compare the satellite record with model results to explore uncertainties, but the satellite data is not the ground truth and cannot be used to invalidate the models. The microwave sounding unit (MSU), the instrument used to measure the temperature, measures light in certain wavelength bands emitted by oxygen molecules. Here we go again. The MSU readings are validated in situ with balloon measurements of temperature. So this is a simple, validated transformation between variables, no more sophisticated than a digital thermometer. In contrast, a single parameterization in a GCM is far more sophisticated and requires numerous assumptions, and that is just a tiny part of a full GCM. Implying that this is just one man’s model against another man’s model does more to obfuscate than it does to clarify. Why, yes, there is. YOU can become more educated in science and math–thereby enhancing your value to your society as a voter and adding a great deal of meaning and pleasure to your own life. Don’t be intimidated. Ask questions. Ask for reading suggestions. Ask for help with things you don’t understand. And pay it forward to the next kid or layman who asks help from you. You correctly state that the satellite figures are models, because they require converting microwave brightness into temperature. However, though this is a model, this is just basic physics, and the real model problem is the definition of ‘troposphere’ , or ‘lower troposphere’ or whatever. These are defined by weighting the signals from different regions of the atmosphere, and are models, and give different answers depending on how that are defined , e.g. UAH vs RSS. The real reason to distrust satellite measurements is that the whole process is model dependent. I am looking for help in understanding this. If the surface comparison shows a smaller discrepancy, then this implies a larger discrepancy at altitude. And shouldn’t this matter since the radiation to space comes from higher air (around 5 km in some mean sense). Does this suggest something about the way the models get the surface temperature? Maybe ice clouds are improperly parameterized and result in an energy balance that ‘works’ but fails to capture physics reflected by upper tropospheric air temperatures? What to think or say about the trends from Figure 4 and from Christy’s upper right plot? Aren’t they consistent? Interior Secretary Ryan Zinke signed an order Thursday overturning a ban on using lead ammunition on wildlife refuges. Zinke signed the order on his first day in office, overturning a policy implemented by former Fish and Wildlife Service (FWS) Director Dan Ashe on Jan. 19, the Obama administration’s last full day in office. Ashe’s policy banned the use of lead ammunition and fishing tackle on all FWS wildlife refuges that allow hunting or fishing, as well as in all other hunting or fishing regulated by the agency elsewhere. It was meant to help prevent plants and animals from being poisoned by lead left on the ground or in the water. The modeling is more complicated than that. We are heading for the Winter maximum, although it looks as if it will be the lowest maximum ever recorded, a “minimum maximum” if that term makes sense. I wonder how that figures in the climate models, or indeed in the skeptics’ (vexatious?) disputation of the forecasts derived from those models. Thank you for your suggestions (I’ll get right on it…), but I think you miss my point. Sure, I can “improve” myself (it will only take a few years, I’m sure), but should I do so, that won’t have much affect on the other 99.98999% (would this be statistically correct?). In failing to, at least, get me to “feel” like I understand, you can, at best, ask me to take you on faith. And, frankly, given how few scientists seem to take the threats of global warming seriously enough to actually DO something about it (besides change their light bulbs? ), I can’t say that I really have that much faith. Not really. Global warming is based on evidence, observations, theories (like the greenhouse theory), and laws of physics. And we know it is our CO2 up there since the ratio of fossil fuel burning CO2 isotopes are increasing. The models just help to project what the temps may be in the future, so we can plan ahead. No projection is exact; if it comes close it is said to have “skill.” Usually the projections will overestimate the problem part of the time, and underestimate it part of the time. After having slightly underestimated actual temps in the late 90s, then having overestimated them for some years, the models are now as of 2016 about on the line. What I see in those little blue and green squares and circles are temps taken high up in the atmosphere, maybe close to the stratosphere. Note that it’s actually getting colder above the greenhouse gas area (which is below the stratosphere) bec less heat is escaping the earth system. If you run your sight up vertically from the year 2016 and horizontally from 1C (the global average temp for 2016) to where it intersects with 2016, you will see the models’ averages (solid and broken black lines) are practically right on the line! Together these models give highly “skilled” results. These modelers are geniuses! This deceptive graph reminds me of people who cheat at cards. I guess they also have the same motives — making money (from the fossil fuel industry) by cheating people. Cheating people and their progeny out of a viable future. Bad. I don’t agree entirely with those who suggest you work hard to become more numerate, though it’s not a bad suggestion. I’m going to ramble a bit here, as it is a subject that interests me and I’m an odd crossover with science. I sometimes call my method an old lady kicking the tires. I don’t know cars, but I have good instincts about people. The part of education that seems to be going missing these days is not the higher reaches of math and science per se, but an understanding of how science works and what it is, which includes curiosity and honesty as well as methodology. We type on computers but we don’t need to know how 0 and 1 are put together into electrical (magnetic) signals to make that work. We all use plumbing, but we don’t need to know how it works, just how to find a reliable expert. We depend on medicine, but we don’t need to know the subject, but how to find an expert and how to pay for care. We use bridges and transport, but we leave engineering to engineers (and the precision that makes specific engineering feats work is not always the right kind of thinking for something like climate science, which is complex, multidisciplinary, and needs to be able to tease out signal from noise). I had the fortune to be born into the higher reaches of science, but my father (PW Anderson) was disappointed a couple of evenings ago when he was trying to explain his interest in hydrogen to me, with references to helium, and I had to confess I couldn’t follow him. I think he thought that his daughter should be good at physics! I’m not terrible at science, and briefly did well with the physical side of chemistry at MIT, but it’s not my subject and I’ve forgotten more than I know. I also taught basic life drawing at MIT, and have worked as colleague with scientists during my working career. Coming to the point, I have every reason in many decades of friendship, collaboration, and teaching to trust both the process and personnel of science. They are extraordinarily honest, they know what hard work is, and they know the pitfalls of making assumptions and trying to fit facts to them, and don’t give in to the impulse. They want to know everything about something, not something about everything (my flaw, among others). Scientists are not particularly well paid, when you consider that qualifying takes almost a dozen years of higher education (beyond high school) at the highest level. Their “grants” pay for staff and material, and are not money for honey (unlike subsidies to big fossil, earnings over over 100:1 per lobbying dollar). We have every reason to trust the scientific process, which has evolved by trial and error for centuries (millenia). Peer review is the worst system except for all the others. Media are in the business of getting eyeballs and clicks for advertising. We’ve fallen into the trap of thinking there is a peer-review system for the media, and that we can pick and choose our facts from the air. Facts aren’t like that. Religion has also been distorted for gain (witness US Congress; Jesus wouldn’t like those guys; hypocrite central). Science is worthwhile because of its integrity, and the small but highly visible denial industry has very little of that. Jeff Sessions, for example, thinks science trespasses on god; Lamar Smith is a Christian Scientist. These guys have never done the hard work of finding out and setting aside their prejudices and profits. Now hang on a moment… That’s good advice as far as it goes, but I’m not sure that it resolves Gordon Shephard’s dilemma. One of the reasons Mr. Snowball gets away with this is because so much discourse on AGW ends up in weeds where people just don’t want to go. There’s no easy solution insofar as I doubt that trying to pick up people one at a time with admonishments to hit the textbooks is effective. And if you (one, we…) can’t do a better job of thinning out, organizing, and boiling down the weeds, then poison ivy will always have a safe home in leadership positions (to torture a metaphor). One small nitpick, or clarification. Regarding the t-test … If this were done, it should be done using a dependent t-test, such as one involving pairing of observations from the two series, perhaps by binning them in time. Otherwise there’s an assumption of year-after-year independent of, say, residuals, and that’s probably not valid. It should be possible to make a proper comparison of the two, if wanted, by considering the complexity by comparing model evidence, whether from the CMIP5 or from the claimed calibrated satellite data. However, the more crucial question is whether or not, during the period of comparison, the Earth climate system is behaving representatively of the continuing trend or not, since it itself is a system of considerable complexity, and this ought to be rolled into the comparison as well. Setting aside the cheap shot re: light bulbs, you are setting up a straw man there. Scientists do peer-reviewed research and provide results to enable policy to be developed to address the problem. They are not the policy makers. Susan, I, too, have a deep respect for the work, and the persons, of the folks who pursue scientific research. However, it is not for myself that I am attempting to speak, but for the great mass of folks whose money is being used, whether for honest or for nefarious purposes. If people feel disrespected, which I believe they often do when confronting those who speak for science, they will not, all too often, seek to educate themselves to the point where they might listen at the same level as at that to which they are being spoken. Rather they will listen to someone who at least “seems” to respect them, someone who may be pursuing an agenda that is not in their best interests. It is at that point that folks start insisting that their money be left in their pockets, thank you very much. And the grant money on which scientific research is pursued (however easily the Federal Reserve may print it), will ultimately come out of someone’s pocket. RE My post @9, Sorry to say, my links were not properly entered. HERE’s the first, corrected, and HERE’s the second. Also, HERE’s THE LINK to the PDF of Michaels testimony. There was a comment yesterday (since deleted? ), in which it was claimed that the MSU/AMSU data was validated by comparison with balloon data. That comparison applied a model to the balloon data to simulate the co-located MSU measurements. This process does not validate the additional processing required to forge a continuous time series from instruments on 13+ satellites. It’s that process of merging the separate time series which leads to the differences between the global TMT time series produced by three groups. In fact, it’s obvious from Christy’s graphs that the balloon data and the satellite data are different, diverging after the 1992 eruption of Pinatubo, with a drop in the balloon data that’s muted in the satellite series. Furthermore, Christy’s latest graph in Michaels PDF shows some subtle differences compared with those presented last year, repeated here in the lead post. And, as I mentioned, Christy padded (i.e., fabricated) the two end values for the 5 year average of the satellite series, but did this only for one of the years at the beginning. Why is he inconsistent, inquiring minds want to know. Should society trust someone who refuses to present the background material for his presentations? Thanks Radge Havers, that’s a good summary. Thanks GS for the courteous reply. With respect to money, I seem to have failed to make my point. Here are two references amongst many I might find. Fact is, the longer we put off solving these problems as a community, the more it costs, both in immediate consequences and long-term ones. Climate change and global warming are threat multipliers, as the military and insurance will tell you. Maybe scientists are doing something about it in terms of buying electric cars etc. You are just assuming they don’t. I would like to see evidence one way or the other. But I don’t think you can draw many conclusions from what people personally do or don’t do in a voluntary sense. If one person makes a sacrifice, like buying an electric car which costs more than petrol cars, most will not want to do this unless they are confident many people make a sacrifice. This is because the actions of just a very small number of people will not adequately address climate change, and people understand this. So climate change cannot be solved by simply waiting for people to make such sacrifices. Instead you need community wide schemes like renewable energy, and carbon taxes from which nobody can escape, and which will make a tangible difference. With such schemes buying an electric car becomes far more attractive as an option. So government policy is a huge part of resolving the climate issue. This might not sit comfortably with some peoples political ideologies, but it’s a fact all the same. Gee, Gordon. What, pray, would you have us do? Abandon civilization and live in a cave? Did it ever occur to you that the work scientists are doing is important enough to justify travel to conferences? No, Gordon, really. I’d love to hear how individual scientists can solve this problem by making changes in their lives. Please, share. See, Susan and Radge, this is why I have zero patience with glibertarians like Gordon. In a situation that involves all mankind, they still insist on making it all about them. Is Climate Science the Dog being wagged by the Tail? By marketing shills, the powerful, neoliberal true believers? The numbers speak for themselves? Using the words of deniers reinforces the false frame. Doesn’t it? Yeah I know, seems as though if you’re too nice to them, they just jump the rails and go crashing around the countryside. Still, I think there was a valid question in there, and yes I know, that particular one has pitfalls as well. I am confused by these statements. One compares models to satellites by using the model output as input to an algorithm that generates synthetic brightness temperatures, which are then directly compared to the satellite results. The weighting function approach used by Christy and many other is not exact, but really is close enough for global scale comparisons. (We (RSS + PCMDI) use a radiative transfer model to convert model output to synthetic brightness temperature that is more accurate, and can take into account modeled changes in water vapor and cloud water content, which can be important on regional scales). The satellite data are not really converted to an atmospheric temperature, it is really the other way around i.e. the modeled atmospheric temperatures are converted to satellite measurements. The radiative transfer model used to do this is really quite accurate, despite the fact that it is a “model”. But it is not a model in the sense that a GCM is a model. 1. The satellite record is not long enough eliminate/average away decadal-scale noise in the climate system. We cannot explain the satellite data without involving anthropogenic warming. The satellite data are inconsistent with a “pause” in the warming for time periods longer than about 18 years. Also, I totally agree that Christy’s plots are misleading, due to both the reasons discussed in the post, and the choice of relative offset between the curves. Radge, In my mind, this goes beyond the issue of climate change. It is a matter of whether people are willing and able to accept reality. Cognitive science has shown beyond doubt that we are all deluded. The antidote to that is rigorous science, which will tell us the truth whether we like it or not. If humans insist on embracing delusion even though they have a ready remedy that not only dispels delusion but enriches their lives in innumerable ways in the process, then the demise of the species is inevitable. I really cannot be arsed to care whether climate change is the ultimate agent of that demise. If it isn’t climate change, it will be something else. The ultimate question is whether humans are simply too stupid to survive. First, I don’t know if it originated with you, but “glibertarians” made my morning. So let me quibble a bit on the stupid human problem. It isn’t about rigorous science, but about rigorous thinking. There’s absolutely no reason that we couldn’t have an educated citizenry that embraces delusion for entertainment purposes but functions pragmatically with respect to real-world issues, even without studying specific subject areas. This was the point I made to GS in my reply. Start young, and make “school” a place where one of the main themes is looking at the physical and social world and answering questions in terms of quantities and validated cause and effect and so on. And yes, I know what the obstacles are… laws against critical thinking, oh my. But we shouldn’t restrict ourselves on the subject matter. And remember, humans in the past locally destroyed their environment and food sources, and the light bulb apparently did go off eventually and they figured out a sustainable paradigm. No, I wouldn’t suggest that you give up Civilization and live in a cave. It would be nice, though, if the scientific community could avoid alienating the hoi poloi so deeply that they vote in someone who cuts ALL their funding. Carl Mears, #36, Thanks for your insight. I’ve wondered about the method Christy used to simulate the MSU from the CMIP5 data on the KNMI site. Christy gave a list of the weights he used in a blog post last year. I’ve plotted those weights along with the TMT weights from your RSS web page. As one would expect in order for the result to give a combined value in Kelvin, Christy’s weights add to 1.000. I averaged your land and ocean curves, using 72% ocean and 28% land. The dotted curve is your weighting multiplied by 1.6 to roughly scale your weights to Christy’s. Your weighting function peaks at a lower pressure height than the Christy weights and Christy’s weighting includes more influence from higher levels into the stratosphere. 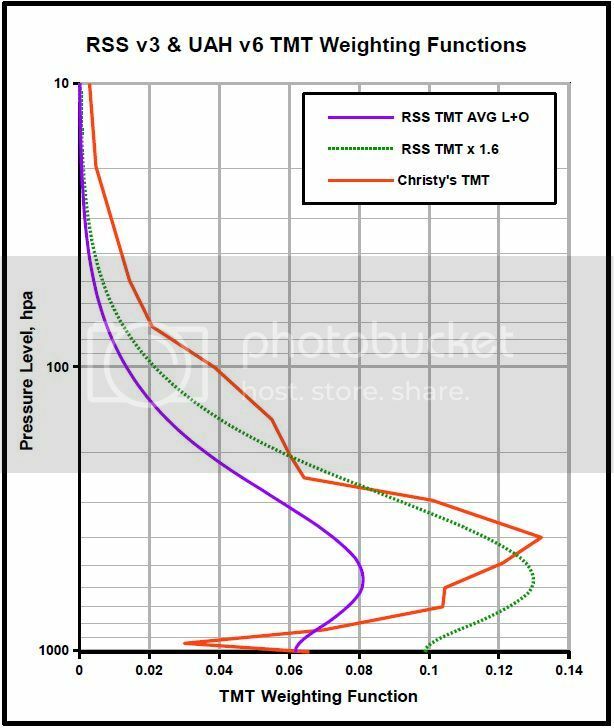 My guess is that Christy used their new TMT v6 to define their weighting values. Would you comment on the differences between these weighting functions? Also, is it reasonable to apply a single set of weights to all the model results, given the seasonal atmospheric variation with latitude over the annual cycle? It would be nice, though, if the scientific community could avoid alienating the hoi poloi so deeply that they vote in someone who cuts ALL their funding. Are you saying the 24% of eligible voters who elected Trump would not have done so if they weren’t alienated by The Scientific Community? I’m skeptical. Please heed the warning. We are the ultimate apex predator. It’s serious and blame doesn’t work. When we’ve altered our hospitable earth further into danger, there will be no escaping. Those thinking of the moon or Mars haven’t looked at the numbers. The antidote to that is rigorous science, which will tell us the truth whether we like it or not. “Science” cannot tell us anything. Only “scientists” can tell us what their “scientific” work entails. Some are better than others at this. 1) The scientist isn’t in fact deluded themselves. 2) That people actually listen to what is being said. 41 Mal Adapted Are you saying the 24% of eligible voters who elected Trump would not have done so if they weren’t alienated by The Scientific Community? I’m skeptical. Didn’t ~50% of eligible voters stay at home? as a longtime researcher in cognitive science and linguistics, I bring a perspective from these sciences to an understanding of the Trump phenomenon. This perspective is hardly unknown. More than half a million people have read my books, and Google Scholar reports that scholars writing in scholarly journals have cited my works well over 100,000 times. Yet you will probably not read what I have to say in the NY Times, nor hear it from your favorite political commentators. You will also not hear it from Democratic candidates or party strategists. You [and everyone else] can only make sense of what the neural circuitry characterizing your worldview allows you to make sense of. What about undeniable all-important facts that violate one’s moral worldview, like the Trump election? That can result in shock, physical shock. We will discuss why below. What is a Political Moderate? A moderate has a major worldview and an opposite minor worldview. A moderate conservative has mostly conservative views, but some progressive views. A moderate progressive has mostly progressive views, but some conservative views. There is no political ideology shared by all moderates. In order to be a moderate, you have to hold two opposing worldviews at once, but apply them to different issues. How can you have two opposing worldviews in the same brain, when each is a fixed neural circuit? Easy. They “inhibit” each other: turning one on turns the other off. This is called mutual inhibition. It is common in the brain. Political change has worked through bi-conceptualism — through moving minor worldviews in a more major direction, by “strengthening” minor worldviews until they become major. The word TRUMP is an answer to that question I think, although just in the U.S.
Th: Didn’t ~50% of eligible voters stay at home? BPL: A great number were turned away by “voter ID laws” that are actually voter suppression laws. In Wisconsin, for example, 130,000 people were turned back from the polls. Trump won that state by 17,000 votes. Between gerrymandering and voter suppression, and the fact that of people who were able to vote, 65 million voted for Hillary and 62 million for Trump, it’s not really accurate to blame Trump on the US electorate. However superior you want to feel about Commonwealth countries, the example of Australia should show you that even Commonwealth country voters are sometimes stuck with unpopular governments that wreak great havoc. Ah, I think I see (one of) your problem(s). You don’t understand how science works. Science is not what any one scientist says. It is what the data allow the community to agree upon say collectively. Science provides a reliable method of discerning truth. Not every single scientist may agree with that truth. If you are relying on a single scientist or source for your “science,” you aren’t relying on science. If given scientist articulates the truth more eloquently than his peers, it’s fine to quote him, but if what he says is not backed up by his peers and the data, it ain’t science. Would you be so kind to give some further clarification? 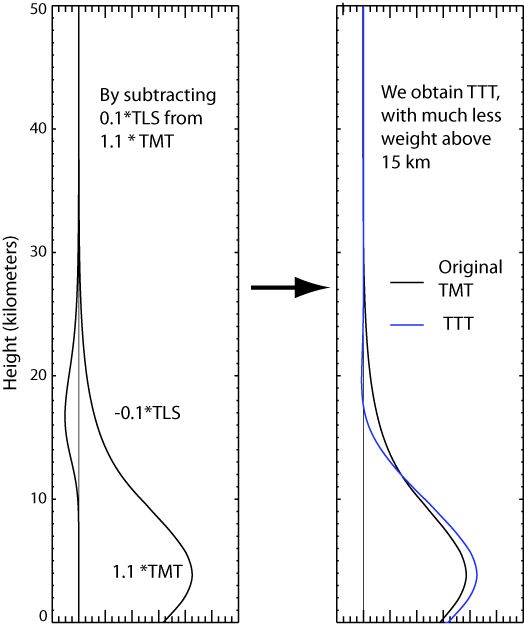 What error from not distinguishing sea-land could result for the tropic TMT? In UAH the difference in the trends over land and over sea is small for this region. And why exactly do the zonal integrated temperature data from CMIP5 not really correspond closely with those measured from satellites? Was kinda hoping someone would address James Wilson #17 comment. Seems like a reasonable question.